In February I always get those antsy feelings of wanting winter to be over and for spring to get here. It doesn't help that there is always that one day that comes along in February that gets up into the 60's and melts all the snow, leaving this golden muddy hue in its wake. This time we have seen a whole lot of ice after that thaw. The kids are missing school and going crazy, us along with them. I started this pattern to celebrate the messiness of the season. Even in the messiness there can be beauty. Just like with all of my tutorials here on the blog, when you are done you will have a dishcloth to use or give away. It's always nice to have something functional to use after we have worked hard to learn something. The main things you will be learning with this dishcloth is how to do a spike stitch and how to make a decrease using 2 slipped stitches. 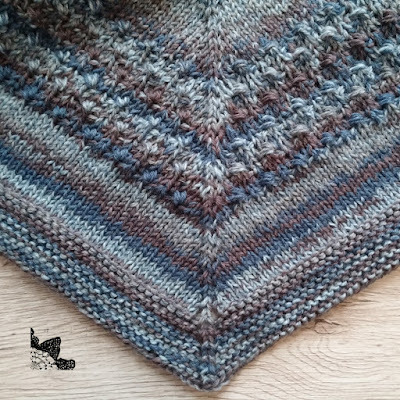 I'm excited for you to learn these so you can join me in making the triangle scarf with this stitch pattern. (you can find that Pattern Here) There is a sneak peek below. Sneak peek at the next knitting pattern coming up! sskp: Slip 2 stitches to the right needle one at a time, k the next st, slip the slipped stitches over the knit stitch just made. Julia Schwartz. Do not reproduce, copy, distribute, or sell this pattern without permission of the designer. This pattern must not be translated, reproduced, or circulated in another language without prior consent. If you have questions about this pattern please contact Julia.diligence@gmail.com. This is a free Pattern right here on the blog. Just keep scrolling down to find the pattern. If you would like an ads free, printer friendly PDF version I have them for sale in my Ravelry Shop for 3.00. Cast on 23 stitches using your favorite cast on. Cast off and weave in your ends.